My friend and former co-worker Amy had her first baby this spring, a sweet girl named Mirah. Amy moved out of the area so I didn't have any in-person clues to use to chose fabrics. 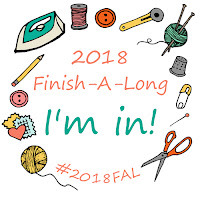 In November 2016, I was the lucky winner of a prize package from Julie of The Crafty Quilter from her monthly "Hello 2016, Good-bye UFO" link-up that month. My prize was a bundle of The Cottage Garden by Riley Blake. I really liked the bird print in my bundle and thought Amy would, too. 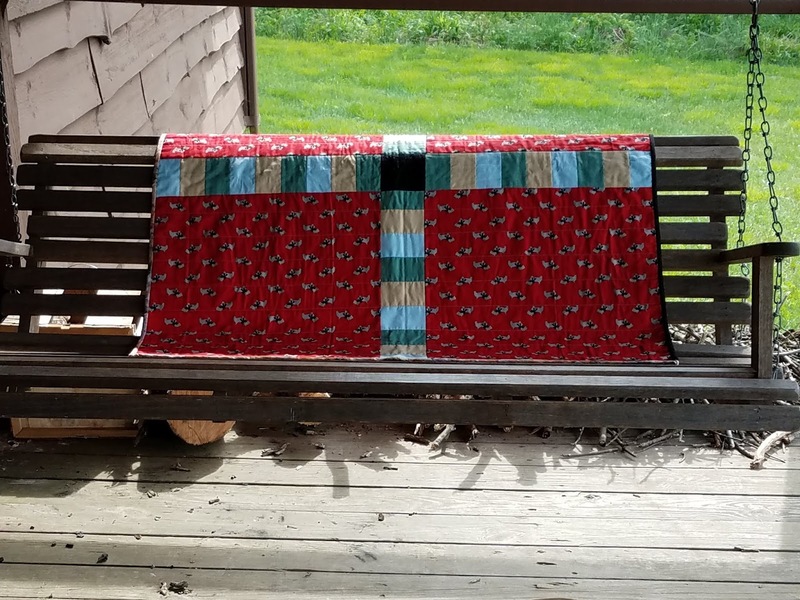 I added one fabric from my stash and used the pattern "Cherish" by Villa Rosa Designs. 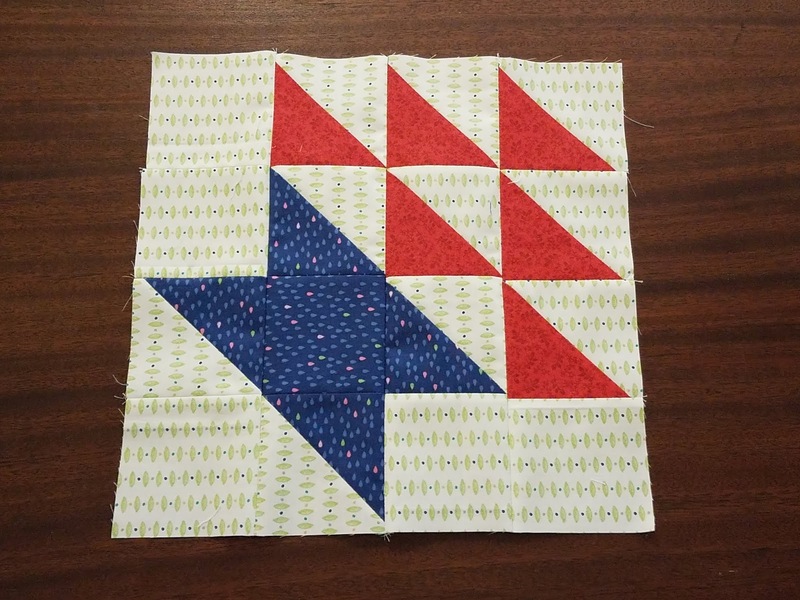 This was a great easy pattern that sewed up quite quickly; I will absolutely use it again! 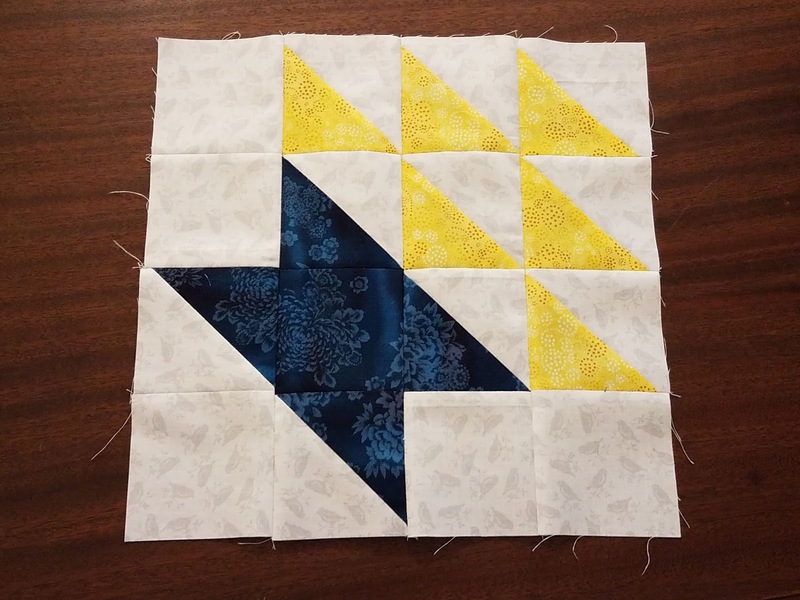 It did end up a little longer than I like for a baby quilt, so I took one row out. I used a dark green leaf print for the back. I didn't have quite enough. While I was looking for something else, I found a group of 3 1/2" wide scraps left from cutting up a batch of dog fabrics given to me by my friend Snow. Amy is a huge dog person, so the minute I saw those scraps, I knew they would solve my problem. I cut the dark green into random pieces and put strips of the scraps in the middle. Most of the fabrics in the bundle were half yard cuts, so I had enough to make a second quilt top. I added in one more fabric from my stash. I have a coworker who is expecting in August; the sister quilt will go to her baby girl. I really like how the quilts have some pink but aren't overwhelmingly pink. I really loved working with these fabrics and am so grateful to Julie for the prize. This was #5 on my list of Q2 goals for the Finish Along. At that point, I had picked out the pattern but was thinking about a different focus fabric. As soon as I remembered this prize bundle, I knew it was the right fabric for this project. I was super on the ball with May's bee blocks, so I guess I felt I needed to compensate by being down-to-the-wire for June. Queen Jen from Bee Inspired left us open to make pretty much whatever we wanted. 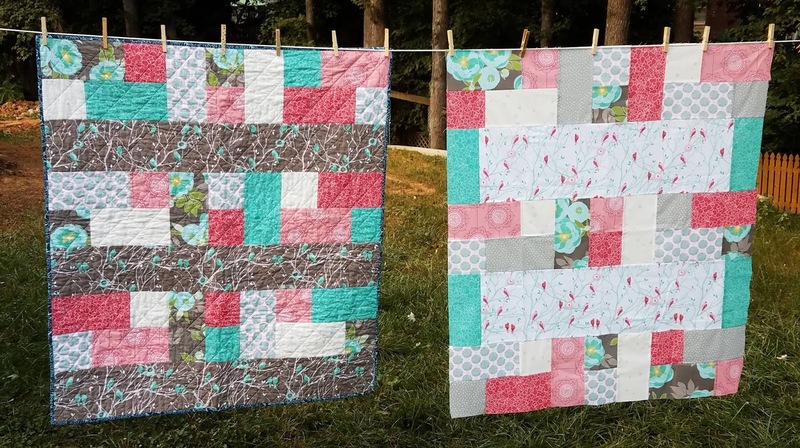 She loves tertiary colors and while she gave us free range, she did highlight some of her favorites from the Quilter's Cache website. One of the blocks in her collage really spoke to me, Galaxy Star. 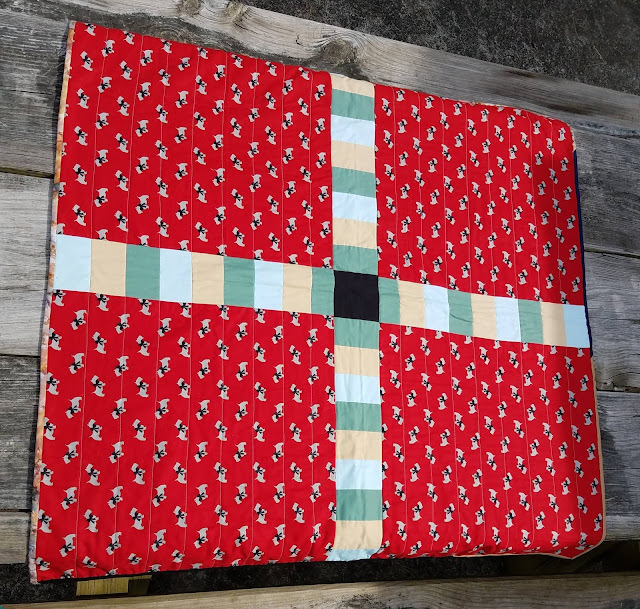 It's paper pieced and makes a 9" block. I changed it a little bit to make the long spikes all one color and the short spikes all one color, rather than the alternating pairs of the original. Queen Diane in Stash Bee asked for a basket block. It's a very traditional looking block. 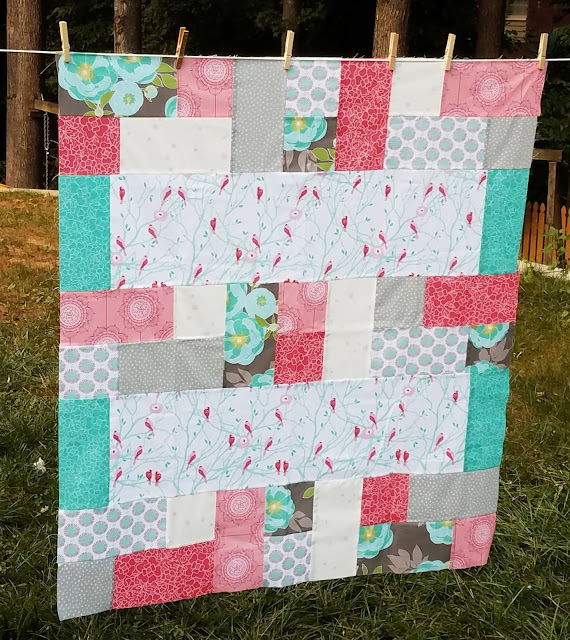 I'm still loving both bees and trying new blocks every month! 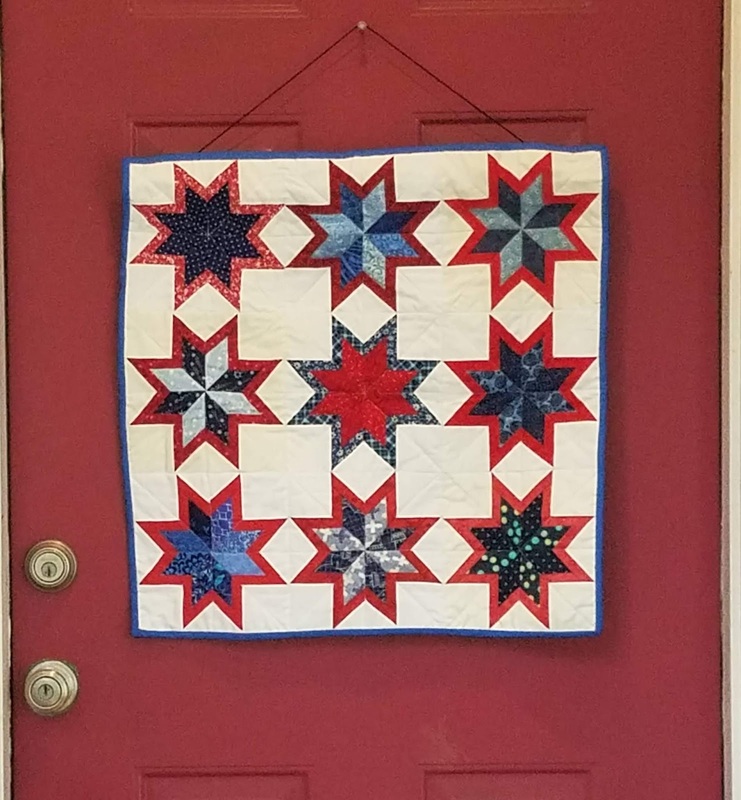 I have slowly been making small quilts to hang on the front door during certain times of year. I've been wanting a red, white, and blue quilt for a while. I decided to use one of my turns as Queen in one of my online bees so I would get a nice, scrappy look. I knew I wanted a star so I started looking at all the many, many beautiful star blocks out there. The minute I saw the Starry Night block by Cath of Wombat Quilts, I knew it was the one. It's a free block but I did still get permission from Cath to use it with Bee Inspired. I knew that I would get more blocks from my bee than I needed for this project, especially with the test blocks I had already made. So there are some stars that didn't make it in this project. Those will go into another quilt that will either be donated to Project Linus or Quilts of Valor, depending on how big it ends up being. So, Bee Inspired friends, if you don't see your block here, don't fret! It will get its moment to shine! I had a kind of wavey flag fabric that I thought would be good for the back. 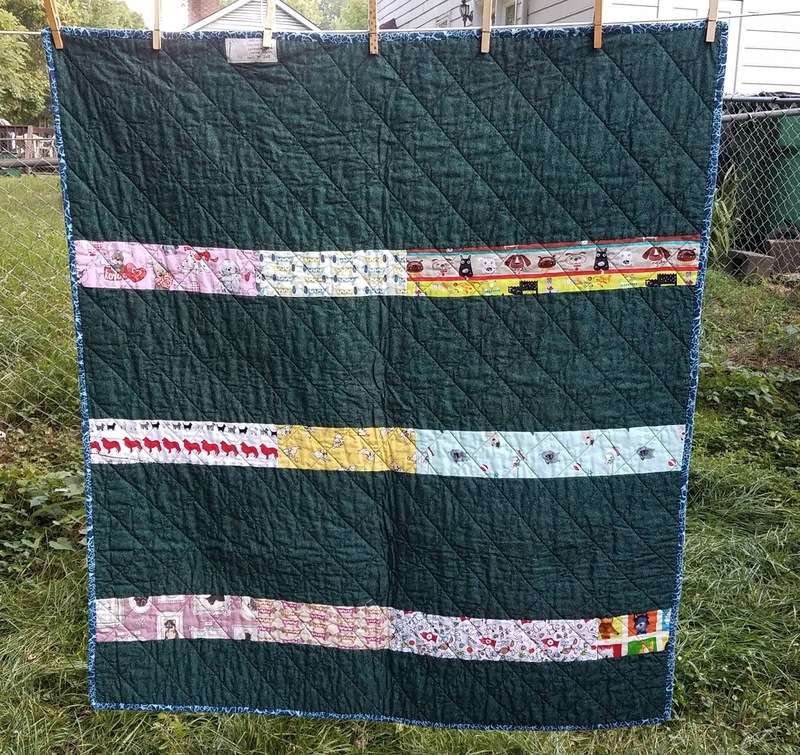 I created a label that lists each person whose block is in this quilt, plus their state and country. I like knowing that I've listed everyone, and it also works as a key to identify who made which block. 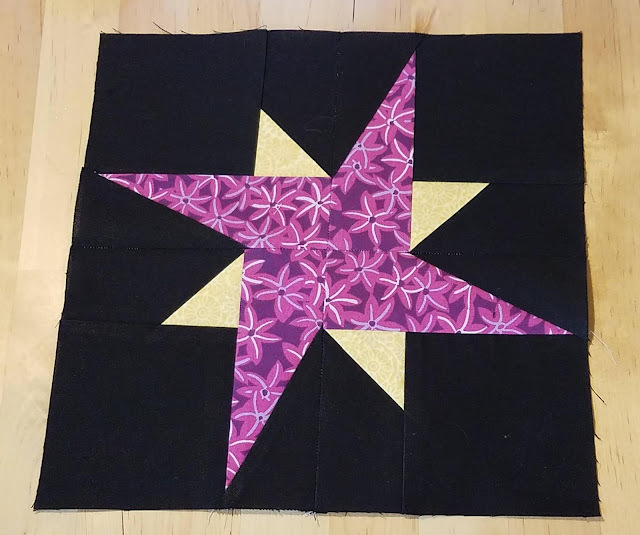 I quilted with straight lines following the diagonals of the stars. The binding is Kona Blueprint. 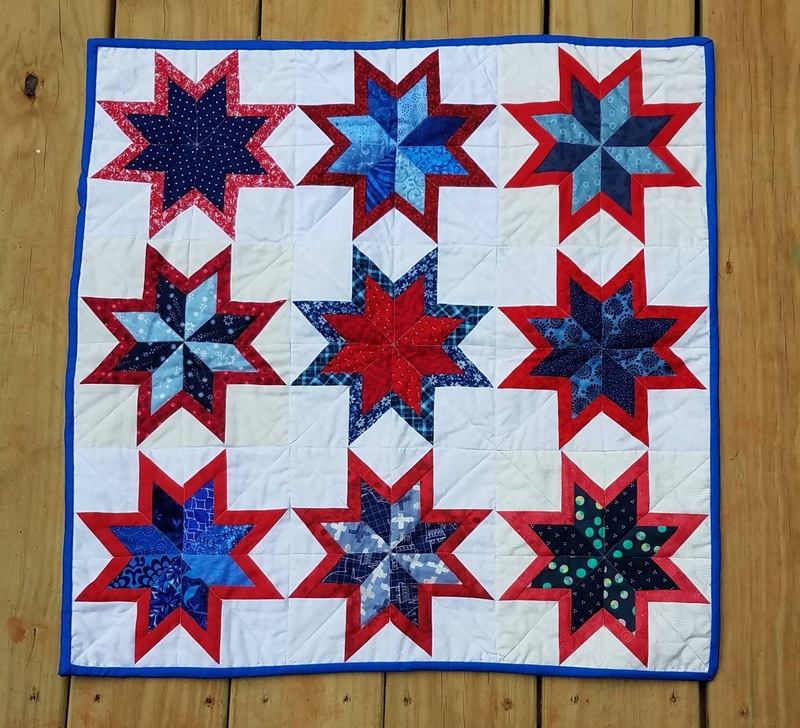 I gave people the choice between making a red star with blue accents or a blue star with red accents. Interestingly, of the eleven blocks I received, only 2 were red stars with blue accents. I chose one for the center and placed the blue stars with red accents around it, trying to balance darker stars with lighter stars. I admit, once I made it I struggled with whether to display it on my door. I'm having a lot of problems feeling patriotic these days, as there is a lot going on in the United States that I am deeply, deeply at odds with. I worry that being outwardly patriotic somehow means I endorse my current governmental leadership, which is not the case. 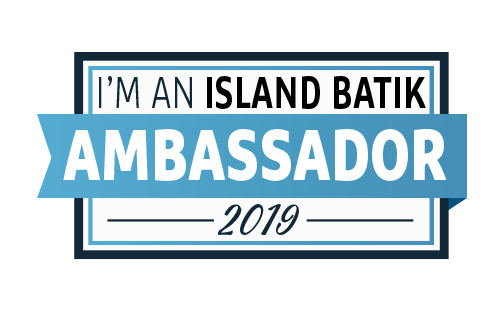 But ultimately I decided that I can love the ideals and spirit in my country and feel pride and patriotism in those ideals and in the people, while still being frustrated by decisions made and priorities set by elected and appointed officials. So it is indeed on the door. This was #10 on my list of Q2 goals for the Finish Along. My local Project Linus friends all know I love novelty fabrics, so when we get donations with animals or other fun stuff, they usually offer it to me. This red Scottie dog print was one that they insisted I needed to take home. 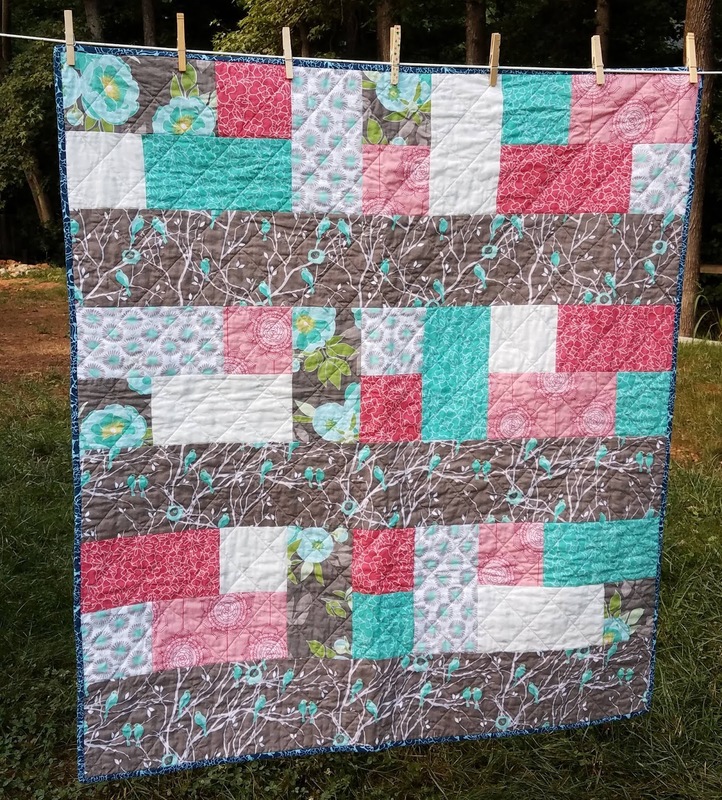 I was inspired by a quilt from Something Rosemade. 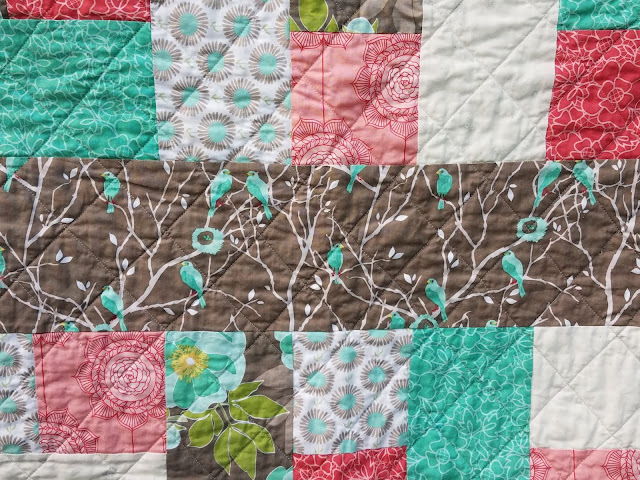 She used 4 large squares of novelty fabrics and inserted a colorful row in between the quadrants. I used random leftover solids for my stripes. I realized too late that my Scottie dogs looked inward toward each other instead of all facing the same direction. Oh, well! 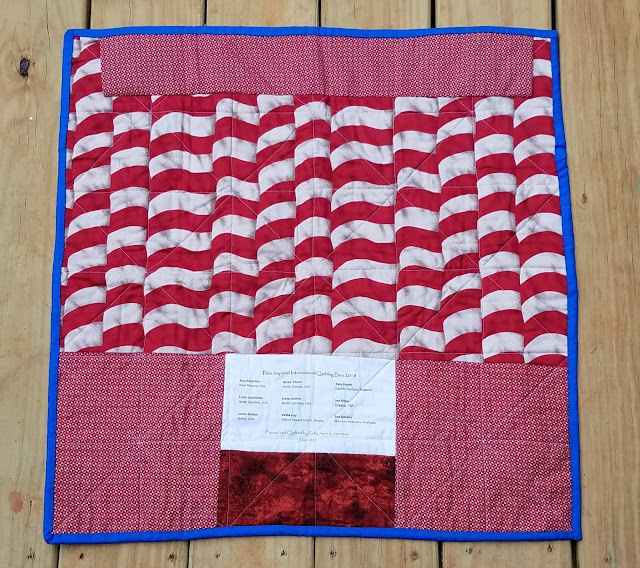 I used scrappy binding in colors that seemed to go with the solid stripes in the middle. It feels great to use up leftovers! This was #15 on my list of Q2 goals for the Finish Along. This is also my list of UFOs to complete for my PhD (Projects Half Done) with Gail of Quilting Gail. I will be donating this quilt to the Charlotte chapter of Project Linus. For the 2017 Rainbow Scrap Challenge, I chose the Elephant Parade pattern by Lorna from Sew Fresh Quilts. When I was putting the top together, I realized that if I used all 7 rows, it would be huge. 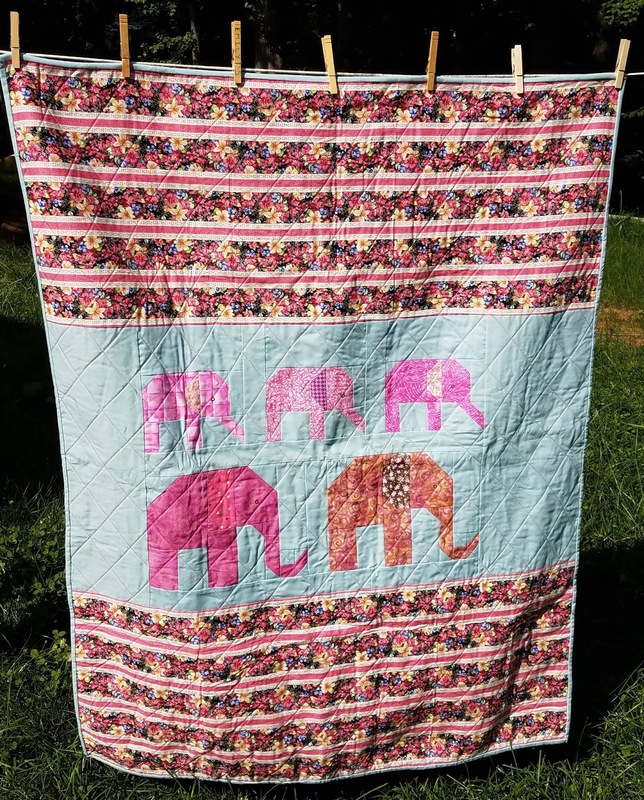 So since pink isn't technically in the rainbow spectrum, I took out the pink row, put the pink elephant family together a different way, and added a floral stripe. So now I present Elephants in the Garden. I used crosshatch quilting with a pink variegated thread. It is backed with bright pink fleece. Elephants was #11 on my list of Q2 goals for the globally hosted finish along. 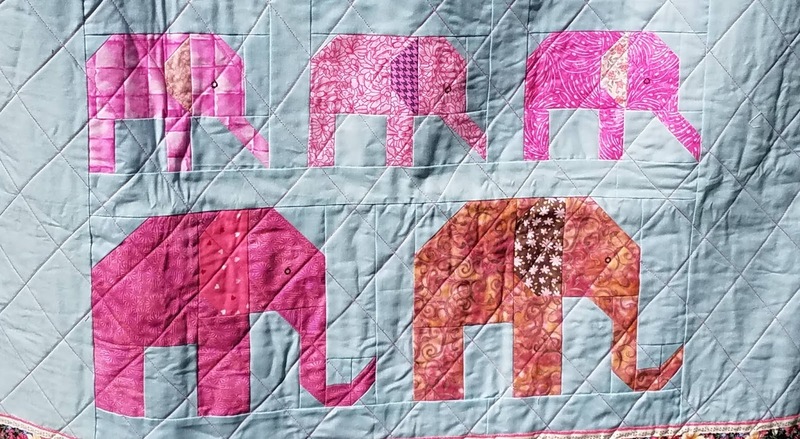 Elephants is also on my list of projects to earn my PhD (projects half done) with Quilting Gail. Elephants has now become two projects; this one, and the originally planned rainbow elephant parade. Rainbow elephant parade is coming; it is layered and ready for quilting and will be given as a baby gift to a child expected in September.